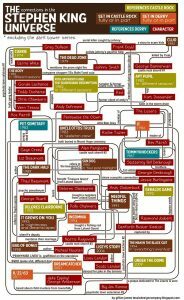 Graphic artist and Stephen King uber-fan Gillian James once took on the epic task of creating a flowchart illustrating the connection between all of the bestselling author’s stories. The resulting crush of information could hardly by absorbed in anything smaller than a poster format, but it was a treasure trove of trivia and insight for fans of King’s extended multi-verse. You can see all of James’ work on her official website. 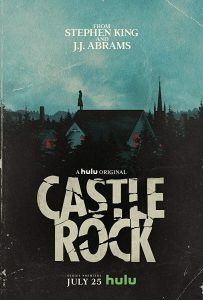 As for Castle Rock, Episode 1 premiered on Hulu earlier this week. You can check out the trailer and synopsis below. Castle Rock may be the most notorious fictional town created by Stephen King, and it’s also the setting of a new Hulu Original series, premiering July 25. In this short documentary, we visit the actual places in Maine and explore the actual events which inspired King to write about Castle Rock. Then, we learn how the co-creators of the on-screen version of Castle Rock incorporated the town’s dark history into this original story set inside the Stephen King universe. Castle Rock is the fictional town in Maine where many of Stephen King’s novels take place; the show stars André Holland, Melanie Lynskey, Sissy Spacek, Bill Skarsgård, Jane Levy, and Scott Glenn.